The United States Mint began accepting orders for the 2012 Infantry Soldier Silver Dollars on February 16, 2012 at 12:00 Noon ET. The coins are issued under a commemorative coin program authorized by Congress to commemorate the legacy of the United States Army Infantry and the establishment of the National Infantry Museum and Soldier Center. The obverse design of the coin features a modern Infantry soldier charging forward and beckoning troops to follow, symbolizing the “Follow Me” motto of the Infantry. Inscriptions include “Liberty”, “In God We Trust”, and “2012”. The reverse design features the crossed rifles insignia, the branch insignia of the Infantry. Inscriptions include “United States of America”, the denomination “One Dollar”, and “E Pluribus Unum”. The obverse was designed by Joel Iskowitz and sculpted by Michael Gaudioso, while the reverse was designed by Ronald D. Sanders and sculpted by Norman E. Nemeth. 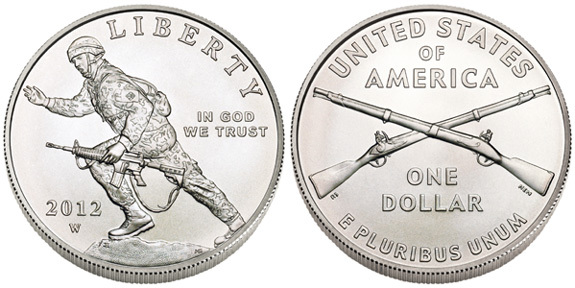 The designs for the Infantry Soldier Silver Dollars were announced in October 2011 prior to a football game between the Fort Benning Doughboys and the Columbus State University Cougars. The selection of the designs was made by the Secretary of the Treasury following consultation with the National Infantry Foundation, Commission of Fine Arts, and review by the Citizens Coinage Advisory Committee. Each coin is struck in 90% silver and 10% copper with a diameter of 1.5 inches and weight of 26.73 grams. The proof and uncirculated versions of the coin are both struck at the West Point Mint and carry the “W” mint mark. Across all product options, the mintage is limited to 350,000. During an introductory period, prices for the coins are $44.95 for the uncirculated version and $49.95 for the proof version. After March 19, 2012, regular pricing of $49.95 for proofs and $49.95 for uncirculated coins will go into effect. No household ordering limits are imposed for the individual proof and uncirculated coin options and shipping is expected to begin within one to two weeks. 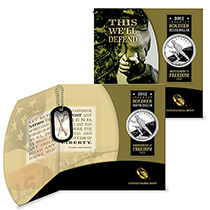 The US Mint is also offering the Infantry Soldier Silver Dollar Defenders of Freedom Set, which includes the proof version of the coin with a replica dog tag on a miniature chain. These are packaged within a custom folder containing a famous quote from President John F. Kennedy, “Let every nation know, whether it wishes us well or ill, that we shall pay any price, bear any burden, meet any hardship, support any friend, oppose any foe, in order to assure the survival and the success of liberty.” These sets are limited to production of 50,000 units and priced at $51.95 each. The US Mint has imposed an initial ordering limit of 100 sets per household and shipping is expected to begin on May 31, 2012. The prices for each coin include a surcharge of $10, which will be distributed to the National Infantry Foundation for the purpose of establishing an endowment to support the maintenance of the National Infantry Museum and Soldier Center after its completion.